The night before choosing the final winner of the short films competition organized by the Festival, the Mauricio Báez hall was the spot chosen to hand out certificates to all of those who participated in the contest. 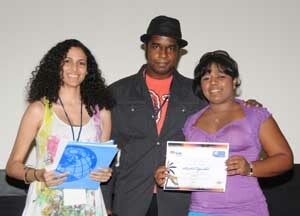 Santo Domingo, November 21, 2009- Over the course of the Festival, before each participating film, for the first time ever, audiences were treated to a screening of the Dominican short films that participated in the contest. All told, eleven films were selected and shown around the country at the various venues. They were all considered winners for having had the golden opportunity of having their work seen by the public. The very idea that the short films participated in the Film Festival was a dream come true. The contest culminated on Saturday November 21 with a ceremony in which some of the young filmmakers proudly took to the stage to receive their certificates in recognition of their work. As planned far in advance of the Festival, the shorts contest is a new section of the Dominican Republic Global Film Festival that seeks to stimulate and provide incentives to young filmmakers around the country. All of the work selected can be seen on the Festival’s webpage. Come and meet the winner!